Tell Me About Your Situation …. Hi, I’m Leslie Vernick. As an experienced counselor, coach and author of 7 books, including the national bestseller, The Emotionally Destructive Relationship and The Emotionally Destructive Marriage, I know that confusion, fear, and blame shifting are part of a manipulators arsenal. But I also know there are some simple, Biblical solutions that you can use to move beyond these tactics so that you learn to say No and live the kind of life that God designed for you. However, I know that no situation is ever the same and you really need advice about your specific situation. So if you take just a few moments to tell me a little bit about yourself and your current situation, I will be able to point you to the #1 best thing for you to do next. So click on the button below and I’ll see you on the other side. "I've benefited immensely from Leslie Vernick's books and speaking ministry. Leslie is faithful to Scripture and her advice is true to life, with a wide understanding drawn from an extensive counseling ministry. I've seen her address potentially explosive issues with compassion and insight. She calls people to God's best and is faithful to the dictates of God's word, but she demonstrates tremendous empathy and understanding in its application. Any ministry that represents such faithfulness to the biblical record along with empathy and understanding is a ministry that I highly trust." "Leslie Vernick gets it! She is a gifted writer, speaker, counselor, and coach who is relevant, insightful, and anchored in Biblical wisdom. It's a pleasure to recommend her as a refreshing leader in today's culture." "I have had the privilege of hearing Leslie speak many times on a variety of topics. I've always walked away wiser and better equipped to minister to others. 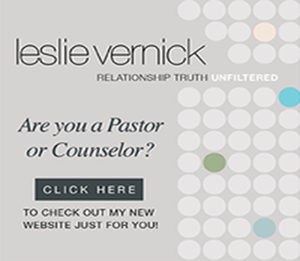 Leslie's messages are always rooted in scripture and applied at a very practical level in a way that testifies to her own vibrant faith and years spent walking alongside those needing help."